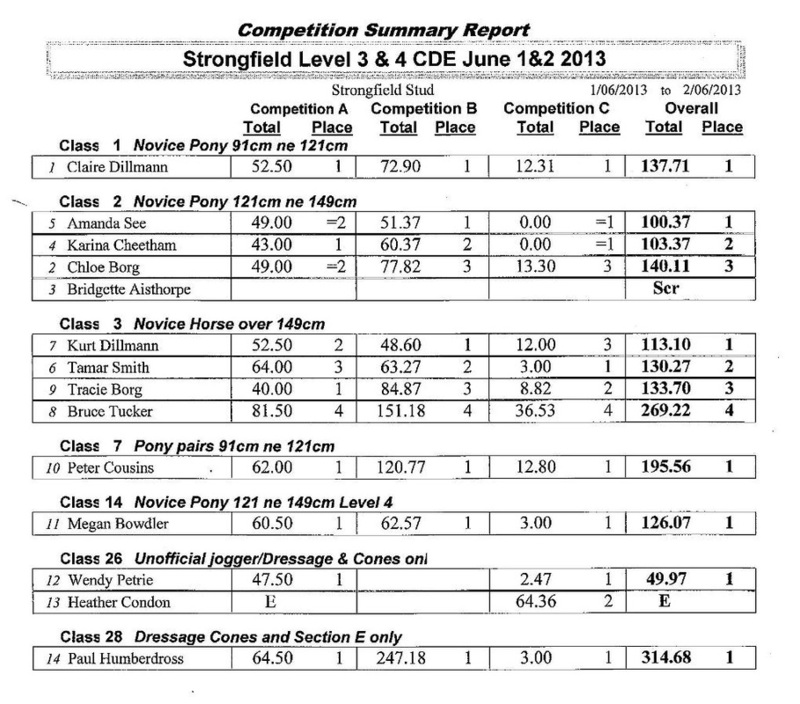 Another successful Combined Driving Event (Level 3 & 4) was held on the 1 & 2 June 2013 by Warwick & District Carriage Driving Club at Strongfield Stud, Southbrook. Competitors travelled from as far away as north Queensland and NSW to be a part of the action. There were 13 competitors, with 6 of the drivers securing qualification for the State Championships to be held at Morgan Park in October this year. Saturday saw competitors beautifully presented for the Dressage and Cones section of the event. It was a credit to the drivers and grooms concerned to see such a high standard across the board. Well done everyone! The weather turned quite overcast, cold and chilly on Sunday for the marathon section but the competitors’ spirit and enthusiasm were in no way dampened by the threat of rain. Drivers and grooms were colourful with Chloe Borg and groom, father Michael, rugging up in matching ‘hoodies’ and Tamar Smith and groom coordinating in pink and purple to match their carriage. We had some first time grooms back-stepping and there were plenty of smiles through the obstacles to go around. One of the highlights of the weekend was the opening of a new marathon obstacle. There was a small ceremony on Saturday afternoon where competitors and stewards gathered onsite to see Linda Doulin unveil the plaque on ‘Linda’s Carousel’. Eugen Dillmann built and dedicated this obstacle to her. Linda then proceeded to ‘drive’ the obstacle on foot cutting the streamers at each ‘gate’. It was pleasing to see spectators again lining the sides of the arenas and roadside on both days and later coming in for lunch and talking to the drivers and grooms and getting to know more about our sport. Congratulations to all the competitors for not only entertaining the spectators but also for displaying great sportsmanship and supporting each other in the true spirit of amateur sport. Thank you to all our officials and helpers for once again allowing Warwick & District Carriage Driving Club to deliver a quality, safe and enjoyable event. Lastly, thank you to our sponsor, the Commonwealth Bank, for donating the competitor prizes.